Pros: A variety of performances in a completely different fringe setting, affordable theatre and a fantastic fringe atmosphere. Cons: Individual shows likely to be risky and inconsistent, not a guarantee for excellent theatre! Our Verdict: Definitely make time to go and see something at the Vault Festival, no need to be too fussy about what! We all have a long list of things we hear about in London but never have the time to actually go and see. I imagine the Old Vic Tunnels is probably high on many such a list at the moment. It sounds exciting; a disused space underground converted into fringe theatre venues, but alas, who has the time to venture that far underground? Well, my advice would be to make time. If it helps, it’s not even that far underground; just a few steps really! Giving performance space and exposure to smaller companies by attaching their name to the venue is a great example of the Old Vic’s commitment to producing accessible, engaging theatre for everyone. 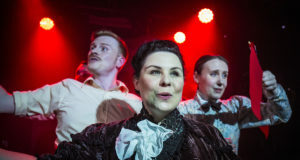 Currently the space is hosting the Heritage Arts Company’s Vault Festival, an arts and entertainment festival where you can enjoy anything from cabaret and parties to ‘immersive opera worlds’ – whatever that means! There’s an interesting array of hotchpotch seating in the bar and lounge area and it seems they’ve left the extortionate bar prices above ground, so your wallet can breathe a sigh of relief. Although the kind people running the Vault Festival insist that you can just come in and chill out, it’s probably more likely that you’ve come to see a show, in which case you’ll be ushered in to one of the converted rooms. Here’s where it helps to keep an open mind, as you may have to embrace some exciting smells and noises along the way- you are in a tunnel after all! The sound of trains passing above will definitely be a factor during performances, which you can either be annoyed about or take as part of the experience. We’ve only managed one visit to the tunnels so far to see Nabokov’s Money, which has now finished its two performances as part of the Vault Festival. The four short plays were supposed to tells us something about our relationship with money but I’m not too sure how successful they were. I didn’t gain a whole lot from being scolded by a banker or watching two guys talk about, well, nothing quite frankly, and then sing a strange song about it. So like all fringe theatre festivals, the standard is most certainly going to be inconsistent – undoubtedly there will be some absolute gems in there, and some catastrophic disasters! 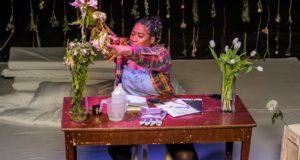 Luckily, the great thing about the Vault Festival is that you don’t necessarily have to see an excellent piece of theatre in order to feel it was worth coming. Experiencing the venue and festival atmosphere can be enough in itself, and a great plus from going along to see something is the exposure to companies you might otherwise miss. Of the four plays in Money, the Fitzrovia Radio Hour won me over with their contribution to the evening. Their blend of satire and homage to 1940s Britain was vastly entertaining and the live sound effects were an ingenious surprise. Incidentally they have a few shows coming up at the Ambassadors Theatre, which I would recommend rushing to! Whilst I didn’t particularly enjoy the piece by Jessica Hynes and Bad Physics I was intrigued enough to find out what else they are up to in London and am consequently keen to attend their production of the rarely performed, Louis de Bernières’ Sunday Morning at the Centre of the World. So there we are. In total, a great venture from the Heritage Arts Company and the Old Vic Tunnels, and definitely one of the things to tick off from your London list. Please feel free to leave suggestions or details about the Vault Festival in the comments section below! The Vault Festival runs at the Old Vic Tunnels until 26th February 2012.